The Maglite ML125 flashlight combines long-famous Maglite beauty, reliability and beam adjustability with powerful new electronics, providing stunning brightness, long battery life and an array of user configurable function sets. Use the flashlight just as it comes out of the package (see function set # 1 standard) or personalizes it to suit your own habits of use by choosing one of the other function sets in the chart shown below. Tbook.com crawls the web to find the best prices and availability on Flashlights and related Tools and Hardware products like Maglite ML125 LED Rechargeable Flashlight. For this page, related items include products we find that match the following keywords: "Flashlight" at our vendor partner Home Depot. 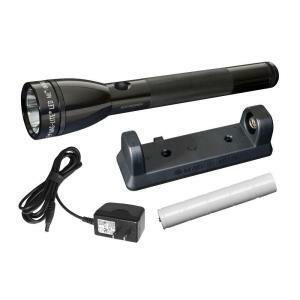 Maglite ML125 LED Rechargeable Flashlight is one of 152 Flashlights and related products listed in the Tools and Hardware section of Tbook.com If you have any questions on this product, please give us a call at 734-971-1210 during the hours of 9am - 5pm EST for assistance. Thank you for shopping at Tbook.com, the Internet Department Store!